St Michael’s Hill has been a major artery into Bristol since at least the 14th century, when it was mapped as ‘the road from Bristol to Hembury’ passing by the Norman church of St Michael on the Mount Without (i.e., outside the city walls). The suburban expansion on St Michael’s Hill had begun by the sixteenth century; the legend to Millerd’s map of 1673 talks of “the riseing of the hill St Michael being converted into comely buildings & pleasant gardens makes a very beautiful addition to the suburbs thereof.” Many merchants would walk up the hill from their warehouses below Colston Street to their fine Tudor and Georgian town houses on St Michael’s Hill, which commands such a fine view of the city. Unfortunately, this central access route into Bristol is now difficult for pedestrians, although it continues to be highly used as a walkway from the heart of the University (Tyndall Avenue), from Kingsdown, and from Cotham. 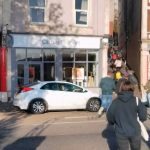 The problem – simply put – is that the motor car is making life impossible, or rather the preference given to the car over the safety and convenience of pedestrians. Pedestrians going up and down the bottom part of St Michael’s Hill have a tough time. They can’t walk safely on the east side of St Michael’s Hill, because there’s no crossing at Horfield Road (no zebra crossing, no pedestrian lights). They can’t walk on the west side of St Michael’s Hill, because there’s no pavement. Instead, they have to walk on the elevated pavement on the west side of St Michael’s Hill which takes them past St Michael on the Mount, down the uppermost section of Christmas Steps, and on to Perry Road. However, Perry Road can’t be safely crossed at that point (no lights, no zebra crossing). When they reach Perry Road, there is a natural ‘desire line’ for a crossing, next to Zero Degrees bar, to the middle section of Christmas Steps into town. There is a desire line, but alas, no crossing. A pedestrian crossing with lights where Horfield Road meets St Michael’s Hill. This route gets a lot of footfall by pedestrians who aren’t familiar with Upper Christmas Steps or who come from Upper Maudlin Road. A pedestrian crossing with lights across Perry Road between Upper Christmas Steps and Middle Christmas Steps. The second is the more controversial, because there is already a pedestrian crossing nearby at the junction of St Michael’s Hill and Perry Road. But a visible crossing joining up the two parts of Christmas Steps will encourage pedestrians to use the route. At the moment people unfamiliar with the area don’t use Upper Christmas Steps, because they don’t notice the steps and don’t know where they lead. They mostly go up St Michael’s Hill using the east side, with its very unsafe challenges at Horfield Road, where they have to cross without a pedestrian crossing. What is necessary is that they be visually directed into Upper Christmas Steps as an important pedestrian route, by the presence of a crossing which will function as visual signal that the top section of Christmas Steps is a pedestrian thoroughfare. They also need a physical sign at the entry of Upper Christmas Steps, indicating where the steps lead to. Both the proposed Horfield Road and the proposed Christmas Steps pedestrian crossings could be painlessly incorporated into the existing 83-second 5-phase traffic-light cycle at St Michael’s Hill / Perry Road / Upper Maudlin St junction. The Christmas Steps crossing would go green and red at the same time as the St Michael’s Hill / Perry Road pedestrian crossing. There would be no disturbance of existing traffic flows, or of the tailback down Perry Road. If anything, a crossing there would speed motor traffic because cars would worry less about pedestrians crossing where there are no lights. 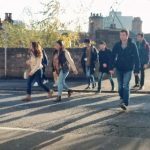 And it would signal to visitors and students unfamiliar with the area that there is a significant and practical pedestrian route from town to the University, to Kingsdown, and to Cotham – via Upper Christmas Steps.